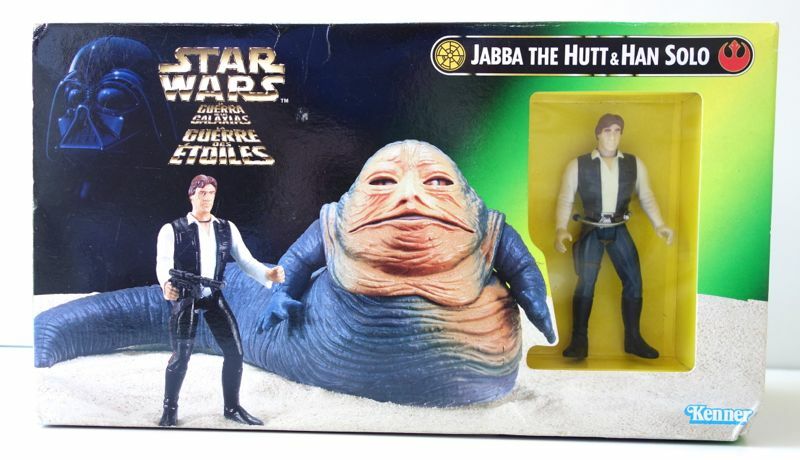 I’ve mentioned more than once that this version of Jabba is by far my least favorite, both in the movies and in toy form. 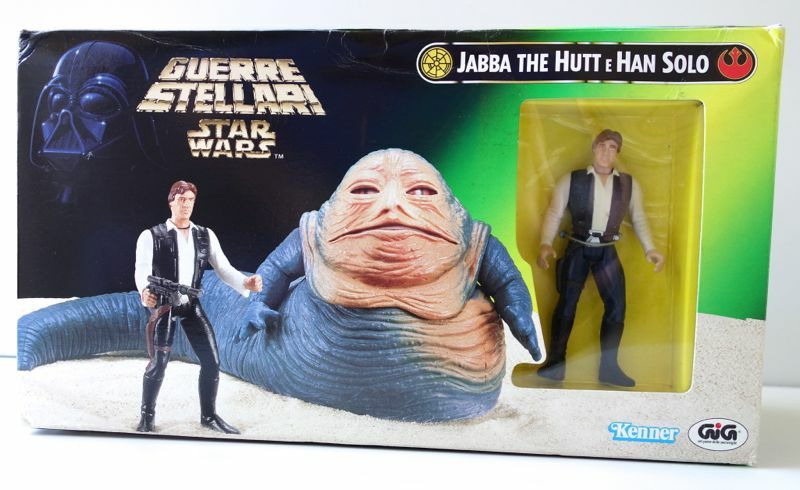 But for whatever reason the POTF2 Jabba figure seems to have the most variants in its packaging. I posted about the differences between the 1996 and 1997 versions recently, and also wrote about the Japanese version (which is really just the American version with a sticker on it). But today I’d like to look at a couple of European variants. The one above has the “Star Wars” logo in three languages on the front (British English, Spanish and French). On the back there is info in five languages (British English, Spanish, French, Dutch and German), so I assume that it was sold in at least those 5 countries, and probably elsewhere in Europe as well. 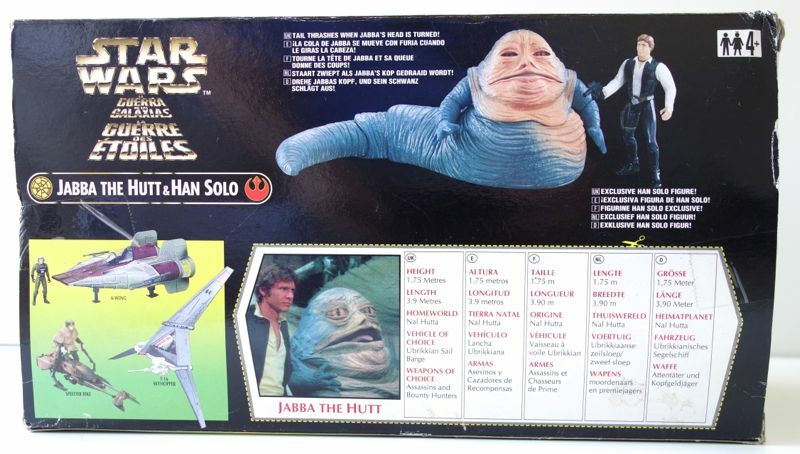 Unlike the spitting Jabba the Hutt with 2-Headed Announcer figure that came out a bit later (which had no less than 6 languages), there is no Italian on this box. Instead, Italy got a box all to itself for some reason. I’m not sure why this is, but it’s interesting. On the front is the Italian Star Wars logo on top of the much smaller English logo. 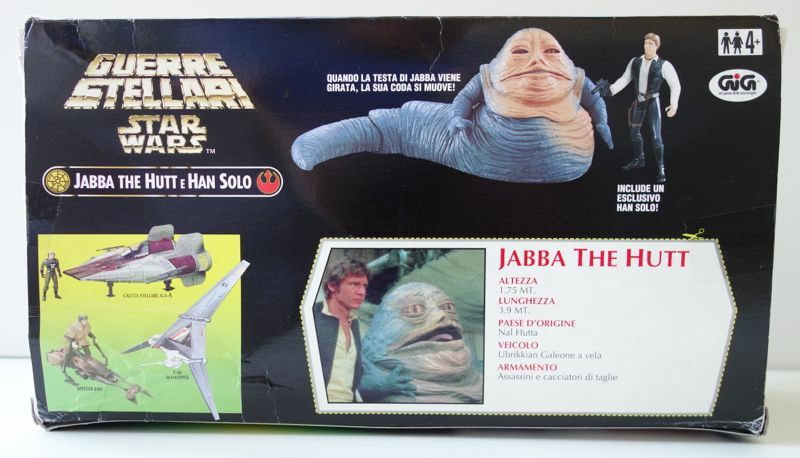 Next to the Kenner logo at the bottom right is the GiG logo, for the company that distributed the figures in Italy. Both of these boxes were in significantly better shape when I won them on eBay, but both sellers thought it would be a good idea to send them merely wrapped in plastic, without any sort of external box. I had to fashion some internal cardboard reinforcements in order to get one of the boxes to even hold its shape again. Disappointing, although I did get a partial refund from the one that was really badly crushed. I must remember to request that these kinds of things be wrapped properly in the future.